Richard Irwin (Belper, United Kingdom) on 23 October 2008 in Plant & Nature. The crossing point of seasons. Ravissante composition avec de jolies couleurs. oh wow! just faaabulously done! winter -- here we come! brilliant shot and wonderfully presented!! bravo!! Wow, great details and colours! Wow, wow, wow! Your design is exquisite! Wow! Delicious, love the title, the text, the photo, the frost, masterpiece of coming season, bravo Richard! I love the title as well as the detail in this image. The lighting is also superb. Cracking shot, is this natural (I hope not, it's too early for frost) or out of your freezer? @DaveB: This week, we had our first frost up here in Derbyshire. You captured the frost very well. Fantastic colors and detail. This is one fantastic macro! Excellent and bravo! Five stars. 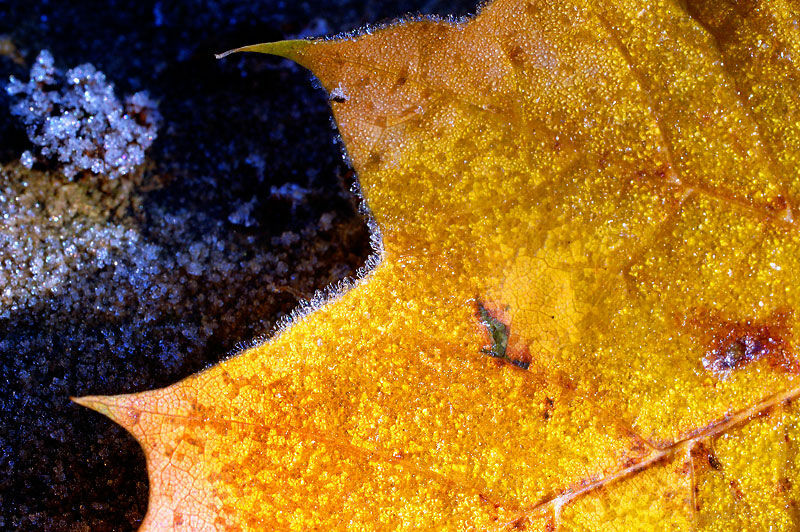 great details, excellent shot indeed..
Beautiful details and colors on that leaf a little frozen. Gold and diamonds! It's great to be able to enjoy this view from the relative warmth of my office!